"A bold experiment in 'shared world' storytelling." In an effort to milk as much as is humanly possible from the release of the blockbuster second film in The Matrix trilogy, The Matrix Reloaded, filmmakers Andy and Larry Wachowski have effortlessly created two releases that tie directly into the trilogy. The first t was Enter the Matrix, a highly stylized video game that takes place parallel to the events of the second film. Second and more ambitious was The Animatrix, a collection of nine animated shorts ranging from computer animation to Japanese anime that offer more insight into the world of The Matrix while helping to tie up a few loose ends. Longtime fans of Japanese anime creators, Larry and Andy Wachowski handpicked each of the artists and directors while also writing three of the nine installments for The Animatrix. The result is a bit of a mixed bag: a handful of the selections have the feel and tone of the blockbuster, while others offer very little to complete circle of films. What is most impressive about The Animatrix is that it is consistently entertaining, offering some moments that are truly awe-inspiring. The Final Flight of the Osirisis the crowning achievement of the collection as it beautifully uses lifelike computer animation. Director Andy Jones (who worked on Final Fantasy: The Spirits Within) begins the proceedings with an incredibly realistic sword duel in a dojo that becomes flirtatious as the sword slices through clothes. Running nearly ten minutes, it follows the crew of The Osiris as they struggle to reach Zion to warn of the impending strike of the machines. Jones has created a true work of art with this piece. Next is The Second Renaissance Parts I and II, which shows the battle between machines and humans and how the human race got where they are today. The shorts are equally bleak in their animation, which is fitting given that the story they tell involves the eventual enslavement of mankind at the hands of the machines. This is perhaps the most important piece of the puzzle when you consider the overall aspect of The Matrix universe. Kid's Story is the last of the shorts that tie into the trilogy of feature films. When a student is given a chance by Neo to escape the Matrix, he takes off on his skateboard as agents chase him through the halls of his closed-off high school. This piece is done nicely with a style reminiscent of Saturday morning cartoons blended with traditional Japanese animation. Program is the most traditional anime of the entries and yet it is the weakest of the collection. Following a Zion-based human who trains in a Samurai-like environment, the short offers no real story as it plods along to a very basic conclusion. World Record is an entry set in the Matrix where a world-class sprinter begins to break free. When he draws the attention of nearby agents, his world is set on its side. The piece is expertly drawn by director Yoshiaki Kawajiri, who brings a very surrealistic look to a simple story. Beyond is a high point in the collection, blending a basic story of a girl looking for her cat with incredible moments of gravity-defying action. Set in a place where the normal laws of gravity do not always apply, this piece is perhaps the best of the collection. A Detective Story takes the viewer back to the days of film noir as it follows a detective on the trail of Trinity only to discover that it is a lethal trap. The piece has an air of nostalgia as director Shinichiro Watanabe creates a world that is reminiscent of forties detective films while adding a modern spin. Finally there is Matriculated by Aeon Flux creator, Peter Chung. This is the most human story of the group as it deals with emotions and beliefs that many of us struggle with on any given day. When a group of rebels capture a machine, they program it to have the beliefs of a human to bad results as, soon, the machine begins to crave human emotions. I liked this piece quite a bit and yet I felt more disconnected from the world of The Matrix films than in the other pieces. As a stand-alone short it excels, but it feels out of place here. So where does The Animatrix rest when all is said and done? One would imagine that the Wachowski brothers created the anthology to fix their craving for Japanese anime, which has been widely publicized since the release of the original film. But at the same time, the shorts are done well enough that they could easily be commended for their own merit in the animation world. Image Transfer Review: Presented in a 2.35:1 anamorphic transfer The Animatrix looks positively stunning. Given the various formats, the video is difficult to judge across the board. Colors are vibrant throughout while sharpness and detail are first rate, offering an amazing amount of detail, particularly in The Final Flight of the Osiris, where the CG creations look amazingly lifelike. A few small instances of edge enhancement are noticeable in isolated areas. Audio Transfer Review: The Dolby Digital 5.1 mix offers an immersing soundfield that rivals many feature films heard today. The surround speakers offer exceptional directionality while the .1 LFE track puts out room-shaking bass. The mix creates a terrific experience and the surround speakers benefit from the split separation to cause many jaw-dropping moments, including several instances where the room seems completely filled with the score by composer Don Davis. Extras Review: Commentary is offered in subtitle form for The Second Renaissance Parts I and II, Program, and World Record. The tracks are uniformly informative, though they too often fall into a narrative of the events onscreen. I admired the tracks for the amount of information that is squeezed into the short time allotted for each episode, but I found I still wanted to learn more regarding stylistic choices as well as influences. Scroll to Screen: The History and Culture of Anime offers a glimpse into the history of Japanese animation, exploring great achievements as well as anime's influence on popular culture. The piece shows the differences between American and Japanese animation, and their origins in Japanese culture. The only downside is that it shows a bit too much regarding The Matrix; in a documentary about the history of anime, I found it inappropriate that so much time was spent on a recent feature. The other significant extra is a fifty-five-minute "making of" that shows the creation of each episode in The Animatrix. The piece features interviews with the animators, who discuss their styles and what it was like to work so closely with the Wachowski brothers. Each segment is available separately or by a convenient "play all" feature. Text bios for each animator are included, as well as a preview for the Enter the Matrix video game. The Wachowski brothers have become two of the most hands-on filmmakers in recent history as they have effortlessly brought the world of The Matrix to numerous fields of entertainment. 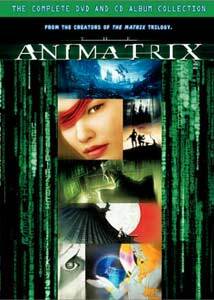 The Animatrix may be their crowning achievement outside of the feature film world as it represents an amazing venture into the world of animation, where the laws of physics and gravity do not apply. As visionary as it is thrilling. Highly recommended.